With the combined effects of an ageing population and increasing travel demand and activity levels, it is important to understand the key issues relating to the safety of older road users. Austroads has published a report identifying trends in crashes involving road users aged over 75.
a summary of relevant sections of road safety strategies in a sample of international jurisdictions. The report provides policy recommendations and describes crash countermeasures relevant to older road users. The research found that the chief risk for older adults in the transport system is not crash occurrence, but high injury severity in the event of a crash, due to greater fragility and frailty. There is much to gain for older adults if vulnerability to injury can be addressed. There is also a need for older adults to have available the best possible occupant protection in the event of a crash. For this reason, it is imperative that programs are implemented to increase the ownership of newer, safer cars among older adults. The road user group with the highest risk of injury in a crash is that of pedestrians aged 75 or more and there is a need to protect older pedestrians. Much of this effort can be directed at pedestrian infrastructure and suitably low speed limits in areas with a high density of pedestrian traffic, especially in areas frequented by older pedestrians. The use of mobility scooters by older adults is an emerging issue and a number of jurisdictions have made considerable policy developments in this area. Analysis of the characteristics of older driver crashes tends to identify collisions at intersections as a common crash type. Interestingly, analysis of crash rates per licensed driver suggests that older drivers do not actually have a higher crash rate at intersections than younger drivers but, nonetheless, one of the most effective avenues to a reduction of older driver crashes will be improving safety at intersections generally. Two methods of achieving this are the simplification of junctions, and reduction of speeds at junctions. Reduced complexity can be achieved by full control of turns (i.e. elimination of right turns requiring gap acceptance decisions), elimination of roads intersecting at acute angles, and the use of roundabouts. Reduced speeds can be achieved by reductions in speed limits and the use of various intersection-specific traffic calming treatments. 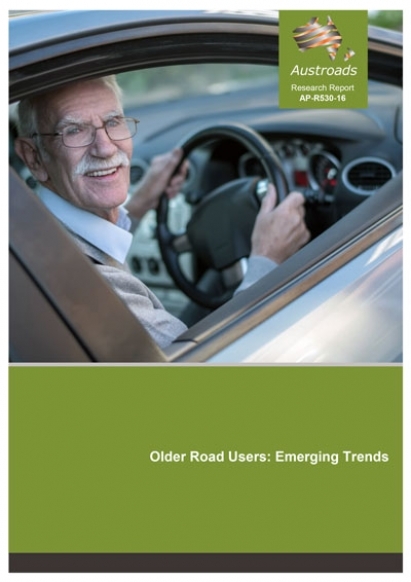 To maximise the benefits of policies for older road users, the report recommends that different groups within government collaborate on developing a more holistic approach to ageing and transport. This webinar will provide attendees with an overview of the emerging trends in crash involvement among older road users, aged 75 years and over. development of countermeasures that reduce both the incidence of crashes and the severity of injury outcomes being experienced by older road users. Presented by Dr Matthew Baldock, Deputy Director of the Centre for Automotive Safety Research at the University of Adelaide. Matthew has worked in the road safety field for 20 years and was awarded a PhD for his thesis on the self-regulation of the driving behaviour of older drivers. He has won a number of awards in his career, including the Peter Vulcan Award for the best paper at the 2008 Australasian Road Safety Research, Policing and Education Conference. No charge, but registration is essential.